The Griffin Society recognizes those who include Montalvo Arts Center in their estate plans. 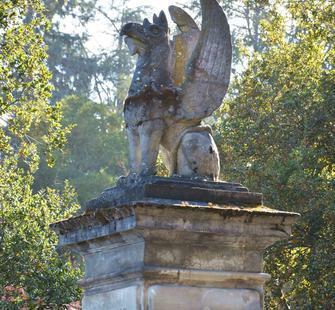 In so doing, like griffins, our Griffin Society donors become guardians of the future of Silicon Valley’s most important cultural, educational, and historic asset. Your commitment, no matter the size of your gift, will ensure that all of Montalvo’s treasures will be enjoyed for generations to come. Planned gifts can offer significant tax advantages and in some cases generate lifetime income for you or your chosen beneficiary. You determine the amount, nature, and purpose of your gift to Montalvo. You may choose to disclose the amount of not. Regardless of the amount, your contribution and your membership in the Griffin Society mark a lasting commitment to Montalvo’s charitable purposes. Benefits of membership in the Griffin Society include invitations to an annual recognition event and other gatherings and donor recognition on Montalvo’s Donor Wall and other donor listings. Your legacy will help us to preserve our Villa and its magnificent 175-acre grounds, continue an inspiring variety of art programs, and enrich the lives of Silicon Valley residents. One of the simplest ways to make a planned gift to Montalvo is through a bequest in your will or a provision in your living trust. You may indicate that Montalvo Arts Center is to be the recipient of a specific amount, a percentage of your estate, or a particular piece of property. "I give and bequeath [describe property] to Montalvo Arts Center, for its general purposes [or other purposes]." "If any or all of my heirs named herein under have predeceased me, I give and bequeath the portion of my estate reserved for that person or persons to the Montalvo Arts Center for its general purposes [or other purposes]." This type of trust pays you and/or another beneficiary income for life, provides a substantial charitable income tax deduction, and can serve as a highly effective means of avoiding capital gains and estate taxes. You can choose either a fixed income or a set percentage of the value of the trust, determined annually. This type of trust gives Montalvo Arts Center income for a set number of years but retains the principal for you or your heirs. A lead trust is especially beneficial to your heirs if you have a large estate and are concerned about federal gift and estate taxes. Removed from your estate, assets placed in a lead trust can be passed to loved ones untouched by the diminishing effects of these taxes. Gifts of real estate can include homes, condominiums, apartments, undeveloped land, farmland, and rental property. A gift of this kind can alleviate capital gains taxes, income taxes, and broker’s fees as well as management costs and responsibilities, while Montalvo Arts Center can receive income or generate capital from your gift. A combined estate and income tax can deplete your retirement account by as much as two-thirds. By naming Montalvo Arts Center the beneficiary of your retirement plan, the remainder of your plan is not taxed and your heirs have no “hidden” income tax liability. Another option is to have your retirement assets transferred to a charitable remainder trust, providing valuable income to an heir for life. You may either contribute the face value of the policy to Montalvo Arts Center as the beneficiary of the policy. An outright gift of your insurance policy will allow you to receive a charitable income tax deduction, while naming Montalvo as your beneficiary helps you avoid federal gift and estate taxes. Griffin Society gifts strengthen Montalvo as it continues to serve as an oasis of culture and nature in Silicon Valley, now and in the years to come. Your legacy will help us to preserve our Villa and its magnificent 175-acre grounds, continue an inspiring variety of art programs, and enrich the lives of Silicon Valley residents. We invite you to join the Griffin Society and to become a part of Montalvo Arts Center’s Future. Your commitment, no matter the size of your gift, will ensure that all of Montalvo’s treasures will be enjoyed for generations to come. For additional information or any questions, please contact Emma Moon, Director of Development: 408-961-5841 or emoon@montalvoarts.org.